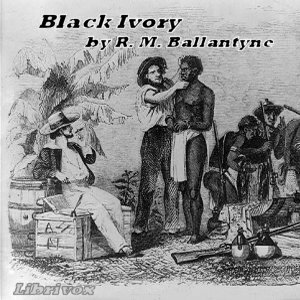 Although the book's title Black Ivory denotes dealing in the slave trade it is not our heroes who are doing it. At the very first chapter there is a shipwreck, which leaves the son of the charterer of the sinking ship, and a seaman friend of his, alone on the east coast of Africa, where Arab and Portuguese slave traders were still carrying out their evil trade, despite the great efforts of patrolling British warships to limit it and free the unfortunates whom they found being carried away in the Arab dhows. Our heroes encountered a slave trader almost at the very spot where they come ashore, and thereby managed to get to Zanzibar in a British warship that had captured the trader's dhow in which our friends had hitched a lift. At Zanzibar they pick up some funds, and set forth on a journey into the interior. Here again they encounter the vile trade, but most of the story deals with other encounters of a more acceptable nature.